Definition at line 78 of file CCopasiMessage.h. Definition at line 81 of file CCopasiMessage.h. Default constructor. This creates a default error messages, which actually does nothing. Definition at line 148 of file CCopasiMessage.cpp. Referenced by getAllMessageText(), getFirstMessage(), getLastMessage(), peekFirstMessage(), and peekLastMessage(). Definition at line 154 of file CCopasiMessage.cpp. Specified constructor. This creates a formated message. Definition at line 160 of file CCopasiMessage.cpp. References C_INT32, handler(), INITIALTEXTSIZE, mNumber, mText, and mType. Definition at line 195 of file CCopasiMessage.cpp. References C_INT32, fatalError, handler(), INITIALTEXTSIZE, Messages, mNumber, mText, and mType. Definition at line 359 of file CCopasiMessage.cpp. Definition at line 131 of file CCopasiMessage.cpp. Referenced by main(), test000104::test_bug1744(), test000091::test_delay_in_kinetic_law(), test000091::test_delay_in_kinetic_law_local_parameter(), test000095::test_import_l3_event_1(), test000095::test_import_l3_event_2(), test000095::test_import_l3_event_3(), test000095::test_import_l3_event_4(), test000095::test_import_l3_event_5(), and validate(). This function clears the message stack. Definition at line 108 of file CCopasiMessage.cpp. Referenced by DataModelGUI::buildChangedObjects(), TaskWidget::commonAfterRunTask(), TaskWidget::commonBeforeRunTask(), TaskWidget::commonRunTask(), CQGLLayoutPainter::draw(), CQRDFTreeView::enterProtected(), CCopasiDataModel::exportMathModel(), CCopasiDataModel::exportSBML(), CCopasiDataModel::exportSBMLToString(), TaskWidget::finishTask(), CCopasiDataModel::importSBML(), CCopasiDataModel::importSBMLFromString(), CCopasiDataModel::loadModel(), CCopasiDataModel::saveModel(), CQMiriamWidget::showEvent(), CopasiUI3Window::slotConvertToIrreversible(), CQExperimentData::slotExperimentChanged(), CopasiUI3Window::slotExportMathModelFinished(), CopasiUI3Window::slotExportSBMLToStringFinished(), FunctionWidget1::slotFcnDescriptionChanged(), CopasiUI3Window::slotFileOpen(), CopasiUI3Window::slotFileSaveFinished(), CopasiUI3Window::slotImportSBMLFromStringFinished(), CopasiUI3Window::slotUpdateMIRIAM(), and CopasiUI3Window::slotUpdateMIRIAMFinished(). Retrieve the text of all messages in the dequeue in chronological or reverse chronological order. If more than on message is in the dequeue the messages are separated by an empty line. Definition at line 93 of file CCopasiMessage.cpp. References CCopasiMessage(), getFirstMessage(), getLastMessage(), and getText(). Referenced by TaskWidget::commonBeforeRunTask(), TaskWidget::commonRunTask(), CQGLLayoutPainter::draw(), CQRDFTreeView::enterProtected(), exportSBML(), CCopasiDataModel::exportSBML(), CCopasiDataModel::exportSBMLToString(), TaskWidget::finishTask(), Arguments::handleCommandLine(), CQFittingWidget::loadTask(), main(), CQMiriamWidget::showEvent(), CopasiUI3Window::slotConvertToIrreversible(), CQTSSAWidget::slotDuration(), CQTrajectoryWidget::slotDuration(), CQExperimentData::slotExperimentChanged(), CopasiUI3Window::slotExportMathModelFinished(), CopasiUI3Window::slotFileOpenFinished(), CopasiUI3Window::slotFileSaveFinished(), TaskWidget::slotFinishThread(), CQTSSAWidget::slotIntervals(), CQTrajectoryWidget::slotIntervals(), CQTSSAWidget::slotIntervalSize(), CQTrajectoryWidget::slotIntervalSize(), CQCrossSectionTaskWidget::slotOutputConvergence(), CQCrossSectionTaskWidget::slotOutputCrossings(), CQCrossSectionTaskWidget::slotOutputDelay(), CQCrossSectionTaskWidget::slotUpdateConvergence(), CQCrossSectionTaskWidget::slotUpdateCrossings(), and validate(). 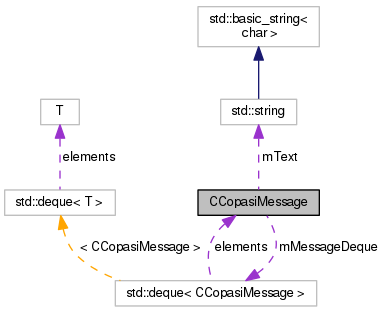 This function retrieves the first message created in COPASI. Consecutive calls allow for the retrieval of all generated messages in chronological order. If no more messages are in the dequeue the message (MCCopasiMessage + 1, "Message (1): No more messages." is returned. Definition at line 69 of file CCopasiMessage.cpp. References CCopasiMessage(), MCCopasiMessage, and RAW. Retrieve highest severity of the messages in the dequeue. Definition at line 119 of file CCopasiMessage.cpp. Referenced by TaskWidget::commonRunTask(), TaskWidget::finishTask(), CFitProblem::initialize(), CQMiriamWidget::showEvent(), and TaskWidget::slotFinishThread(). This function retrieves the last message created in COPASI. Consecutive calls allow for the retrieval of all generated messages in reverse chronological order. If no more messages are in the dequeue the message (MCCopasiMessage + 1, "Message (1): No more messages." is returned. Definition at line 81 of file CCopasiMessage.cpp. Referenced by DataModelGUI::buildChangedObjects(), CFitProblem::calculate(), COptProblem::calculate(), CFitProblem::calculateCrossValidation(), CopasiUI3Window::checkPendingMessages(), CCopasiDataModel::commonAfterLoad(), CExpression::createInitialExpression(), CCopasiXMLParser::ModelParameterElement::end(), CCopasiXMLParser::ListOfModelParameterSetsElement::end(), CCopasiXMLParser::MetaboliteElement::end(), CCopasiXMLParser::CompartmentElement::end(), CCopasiXMLParser::ModelValueElement::end(), CCopasiXMLParser::EventElement::end(), CCopasiXMLParser::AssignmentElement::end(), CCopasiXMLParser::ModelElement::end(), CCopasiXMLParser::TaskElement::end(), CCopasiXMLParser::COPASIElement::end(), getAllMessageText(), handler(), CFitProblem::initialize(), CAnnotation::isValidXML(), CFunctionDB::load(), CMoietiesTask::process(), CRDFGraphConverter::SBML2Copasi(), CopasiUI3Window::slotExportSBMLToStringFinished(), FunctionWidget1::slotFcnDescriptionChanged(), CopasiUI3Window::slotFileOpenFinished(), CopasiUI3Window::slotFileSaveFinished(), CopasiUI3Window::slotImportSBMLFinished(), CopasiUI3Window::slotImportSBMLFromStringFinished(), CopasiUI3Window::slotUpdateMIRIAMFinished(), test000061::test_bug_1044(), test000047::test_delay(), test000090::test_delay_in_function(), test000082::test_export_delayAssignment_2(), test000082::test_export_delayAssignment_4(), test000082::test_export_delayAssignment_6(), test000087::test_export_reaction_flux_reference_2(), test000088::test_import_assignment_without_expression(), test000086::test_import_compartment_units_1(), test000084::test_import_compartment_units_1(), test000085::test_import_compartment_units_1(), test000083::test_import_compartment_units_1(), test000086::test_import_compartment_units_10(), test000084::test_import_compartment_units_10(), test000085::test_import_compartment_units_10(), test000083::test_import_compartment_units_10(), test000086::test_import_compartment_units_11(), test000084::test_import_compartment_units_11(), test000085::test_import_compartment_units_11(), test000083::test_import_compartment_units_11(), test000084::test_import_compartment_units_12(), test000085::test_import_compartment_units_12(), test000083::test_import_compartment_units_12(), test000084::test_import_compartment_units_13(), test000085::test_import_compartment_units_13(), test000083::test_import_compartment_units_13(), test000083::test_import_compartment_units_14(), test000084::test_import_compartment_units_14(), test000085::test_import_compartment_units_14(), test000084::test_import_compartment_units_15(), test000085::test_import_compartment_units_15(), test000083::test_import_compartment_units_15(), test000084::test_import_compartment_units_16(), test000085::test_import_compartment_units_16(), test000083::test_import_compartment_units_16(), test000083::test_import_compartment_units_17(), test000084::test_import_compartment_units_17(), test000085::test_import_compartment_units_17(), test000085::test_import_compartment_units_18(), test000084::test_import_compartment_units_18(), test000083::test_import_compartment_units_18(), test000084::test_import_compartment_units_19(), test000085::test_import_compartment_units_19(), test000083::test_import_compartment_units_19(), test000086::test_import_compartment_units_2(), test000084::test_import_compartment_units_2(), test000085::test_import_compartment_units_2(), test000083::test_import_compartment_units_2(), test000083::test_import_compartment_units_20(), test000084::test_import_compartment_units_20(), test000085::test_import_compartment_units_20(), test000083::test_import_compartment_units_21(), test000084::test_import_compartment_units_21(), test000085::test_import_compartment_units_21(), test000086::test_import_compartment_units_3(), test000084::test_import_compartment_units_3(), test000085::test_import_compartment_units_3(), test000083::test_import_compartment_units_3(), test000086::test_import_compartment_units_4(), test000085::test_import_compartment_units_4(), test000084::test_import_compartment_units_4(), test000083::test_import_compartment_units_4(), test000086::test_import_compartment_units_5(), test000084::test_import_compartment_units_5(), test000085::test_import_compartment_units_5(), test000083::test_import_compartment_units_5(), test000086::test_import_compartment_units_6(), test000085::test_import_compartment_units_6(), test000083::test_import_compartment_units_6(), test000084::test_import_compartment_units_6(), test000086::test_import_compartment_units_7(), test000084::test_import_compartment_units_7(), test000083::test_import_compartment_units_7(), test000085::test_import_compartment_units_7(), test000086::test_import_compartment_units_8(), test000084::test_import_compartment_units_8(), test000083::test_import_compartment_units_8(), test000085::test_import_compartment_units_8(), test000086::test_import_compartment_units_9(), test000084::test_import_compartment_units_9(), test000083::test_import_compartment_units_9(), test000085::test_import_compartment_units_9(), test000077::test_import_dimensionless_3(), test000077::test_import_dimensionless_4(), test000077::test_import_dimensionless_5(), test000088::test_import_eventassignment_without_expression(), test000079::test_import_fast(), test000088::test_import_initialassignment_without_expression(), test000087::test_import_reaction_flux_reference_1(), test000087::test_import_reaction_flux_reference_3(), test000062::test_kineticlaw_without_math(), test000045::test_stoichiometricExpression(), test000044::test_stoichiometricExpression(), and test000046::test_stoichiometricExpression(). Retrieves the number of the message. Definition at line 362 of file CCopasiMessage.cpp. Referenced by CopasiUI3Window::checkPendingMessages(), TaskWidget::commonRunTask(), CModel::load(), CReaction::setScalingFactor(), CopasiUI3Window::slotFileOpenFinished(), CopasiUI3Window::slotFileSaveFinished(), test000082::test_export_delayAssignment_2(), test000082::test_export_delayAssignment_4(), test000082::test_export_delayAssignment_6(), test000088::test_import_assignment_without_expression(), test000086::test_import_compartment_units_1(), test000084::test_import_compartment_units_1(), test000085::test_import_compartment_units_1(), test000083::test_import_compartment_units_1(), test000086::test_import_compartment_units_10(), test000085::test_import_compartment_units_10(), test000084::test_import_compartment_units_10(), test000083::test_import_compartment_units_10(), test000086::test_import_compartment_units_11(), test000085::test_import_compartment_units_11(), test000084::test_import_compartment_units_11(), test000083::test_import_compartment_units_11(), test000085::test_import_compartment_units_12(), test000084::test_import_compartment_units_12(), test000083::test_import_compartment_units_12(), test000085::test_import_compartment_units_13(), test000084::test_import_compartment_units_13(), test000083::test_import_compartment_units_13(), test000085::test_import_compartment_units_14(), test000084::test_import_compartment_units_14(), test000083::test_import_compartment_units_14(), test000085::test_import_compartment_units_15(), test000084::test_import_compartment_units_15(), test000083::test_import_compartment_units_15(), test000085::test_import_compartment_units_16(), test000084::test_import_compartment_units_16(), test000083::test_import_compartment_units_16(), test000085::test_import_compartment_units_17(), test000084::test_import_compartment_units_17(), test000083::test_import_compartment_units_17(), test000083::test_import_compartment_units_18(), test000085::test_import_compartment_units_18(), test000084::test_import_compartment_units_18(), test000083::test_import_compartment_units_19(), test000085::test_import_compartment_units_19(), test000084::test_import_compartment_units_19(), test000086::test_import_compartment_units_2(), test000083::test_import_compartment_units_2(), test000084::test_import_compartment_units_2(), test000085::test_import_compartment_units_2(), test000083::test_import_compartment_units_20(), test000085::test_import_compartment_units_20(), test000084::test_import_compartment_units_20(), test000083::test_import_compartment_units_21(), test000085::test_import_compartment_units_21(), test000084::test_import_compartment_units_21(), test000086::test_import_compartment_units_3(), test000083::test_import_compartment_units_3(), test000084::test_import_compartment_units_3(), test000085::test_import_compartment_units_3(), test000086::test_import_compartment_units_4(), test000084::test_import_compartment_units_4(), test000083::test_import_compartment_units_4(), test000085::test_import_compartment_units_4(), test000086::test_import_compartment_units_5(), test000085::test_import_compartment_units_5(), test000084::test_import_compartment_units_5(), test000083::test_import_compartment_units_5(), test000086::test_import_compartment_units_6(), test000084::test_import_compartment_units_6(), test000083::test_import_compartment_units_6(), test000085::test_import_compartment_units_6(), test000086::test_import_compartment_units_7(), test000085::test_import_compartment_units_7(), test000084::test_import_compartment_units_7(), test000083::test_import_compartment_units_7(), test000086::test_import_compartment_units_8(), test000085::test_import_compartment_units_8(), test000083::test_import_compartment_units_8(), test000084::test_import_compartment_units_8(), test000086::test_import_compartment_units_9(), test000083::test_import_compartment_units_9(), test000084::test_import_compartment_units_9(), test000085::test_import_compartment_units_9(), test000077::test_import_dimensionless_3(), test000077::test_import_dimensionless_4(), test000077::test_import_dimensionless_5(), test000088::test_import_eventassignment_without_expression(), test000079::test_import_fast(), test000088::test_import_initialassignment_without_expression(), test000087::test_import_reaction_flux_reference_1(), test000087::test_import_reaction_flux_reference_3(), and test000062::test_kineticlaw_without_math(). Retrieves the text of the message. Definition at line 360 of file CCopasiMessage.cpp. Referenced by CopasiUI3Window::checkPendingMessages(), SBMLImporter::createCModelFromSBMLDocument(), getAllMessageText(), SBMLImporter::importEvent(), SBMLImporter::importEvents(), SBMLImporter::importFunctionDefinitions(), SBMLImporter::importInitialAssignments(), main(), CopasiUI3Window::slotFileOpenFinished(), CopasiUI3Window::slotFileSaveFinished(), test000090::test_delay_in_function(), test000077::test_import_dimensionless_3(), test000077::test_import_dimensionless_4(), test000077::test_import_dimensionless_5(), and test000079::test_import_fast(). Retrieves the type of the message. Definition at line 361 of file CCopasiMessage.cpp. Referenced by CopasiUI3Window::checkPendingMessages(), SBMLImporter::importEvents(), SBMLImporter::importInitialAssignments(), CQFittingWidget::loadTask(), test000090::test_delay_in_function(), and test000062::test_kineticlaw_without_math(). The actual constructor of a message. Definition at line 239 of file CCopasiMessage.cpp. References COMMANDLINE, COMMANDLINE_FILTERED, COptions::compareValue(), ERROR, ERROR_FILTERED, EXCEPTION, EXCEPTION_FILTERED, getLastMessage(), IsGUI, lineBreak(), LocalTimeStamp(), MCCopasiMessage, mNumber, mText, mType, RAW, RAW_FILTERED, TRACE, TRACE_FILTERED, WARNING, and WARNING_FILTERED. 328 // Remove the message: No more messages. Inserts line breaks in the message text. Definition at line 364 of file CCopasiMessage.cpp. Definition at line 351 of file CCopasiMessage.cpp. References mNumber, mText, and mType. This function peeks at the first message created in COPASI. If no more messages are in the dequeue the message (MCCopasiMessage + 1, "Message (1): No more messages." is returned. Definition at line 51 of file CCopasiMessage.cpp. This function peeks at the last message created in COPASI. If no more messages are in the dequeue the message (MCCopasiMessage + 1, "Message (1): No more messages." is returned. Definition at line 60 of file CCopasiMessage.cpp. Referenced by TaskWidget::commonRunTask(), SBMLImporter::createCModelFromSBMLDocument(), CQGLLayoutPainter::draw(), TaskWidget::finishTask(), SBMLImporter::importEvent(), SBMLImporter::importEvents(), SBMLImporter::importFunctionDefinitions(), SBMLImporter::importInitialAssignments(), CFitProblem::initialize(), CFunctionDB::load(), CQFittingWidget::loadTask(), CopasiUI3Window::slotExportMathModelFinished(), FunctionWidget1::slotFcnDescriptionChanged(), and CopasiUI3Window::slotFileSaveFinished(). Set whether the messages are created from COPASI as GUI or commandline. This method is called from CCopasiRootContainer::init and there should be no need to call it otherwise. Definition at line 143 of file CCopasiMessage.cpp. Definition at line 114 of file CCopasiMessage.cpp. Referenced by CCopasiDataModel::commonAfterLoad(), CExpression::createInitialExpression(), CCopasiXMLParser::ModelParameterElement::end(), CCopasiXMLParser::ListOfModelParameterSetsElement::end(), CCopasiXMLParser::MetaboliteElement::end(), CCopasiXMLParser::CompartmentElement::end(), CCopasiXMLParser::ModelValueElement::end(), CCopasiXMLParser::EventElement::end(), CCopasiXMLParser::AssignmentElement::end(), CCopasiXMLParser::ModelElement::end(), CQRDFTreeView::enterProtected(), CODEExporterXPPAUT::exportSingleLine(), CAnnotation::isValidXML(), CMoietiesTask::process(), CRDFGraphConverter::SBML2Copasi(), CQMiriamWidget::showEvent(), CQExperimentData::slotExperimentChanged(), TaskWidget::slotFinishThread(), test000089::test_bug1412(), test000104::test_bug1744(), test000061::test_bug_1044(), test000082::test_export_delayAssignment_2(), test000082::test_export_delayAssignment_4(), test000082::test_export_delayAssignment_6(), test000087::test_export_reaction_flux_reference_1(), test000087::test_export_reaction_flux_reference_2(), test000088::test_import_assignment_without_expression(), test000086::test_import_compartment_units_1(), test000085::test_import_compartment_units_1(), test000084::test_import_compartment_units_1(), test000083::test_import_compartment_units_1(), test000086::test_import_compartment_units_10(), test000083::test_import_compartment_units_10(), test000085::test_import_compartment_units_10(), test000084::test_import_compartment_units_10(), test000086::test_import_compartment_units_11(), test000083::test_import_compartment_units_11(), test000085::test_import_compartment_units_11(), test000084::test_import_compartment_units_11(), test000083::test_import_compartment_units_12(), test000085::test_import_compartment_units_12(), test000084::test_import_compartment_units_12(), test000083::test_import_compartment_units_13(), test000085::test_import_compartment_units_13(), test000084::test_import_compartment_units_13(), test000085::test_import_compartment_units_14(), test000083::test_import_compartment_units_14(), test000084::test_import_compartment_units_14(), test000083::test_import_compartment_units_15(), test000085::test_import_compartment_units_15(), test000084::test_import_compartment_units_15(), test000084::test_import_compartment_units_16(), test000083::test_import_compartment_units_16(), test000085::test_import_compartment_units_16(), test000084::test_import_compartment_units_17(), test000083::test_import_compartment_units_17(), test000085::test_import_compartment_units_17(), test000084::test_import_compartment_units_18(), test000083::test_import_compartment_units_18(), test000085::test_import_compartment_units_18(), test000084::test_import_compartment_units_19(), test000085::test_import_compartment_units_19(), test000083::test_import_compartment_units_19(), test000086::test_import_compartment_units_2(), test000085::test_import_compartment_units_2(), test000084::test_import_compartment_units_2(), test000083::test_import_compartment_units_2(), test000084::test_import_compartment_units_20(), test000083::test_import_compartment_units_20(), test000085::test_import_compartment_units_20(), test000084::test_import_compartment_units_21(), test000085::test_import_compartment_units_21(), test000083::test_import_compartment_units_21(), test000086::test_import_compartment_units_3(), test000085::test_import_compartment_units_3(), test000084::test_import_compartment_units_3(), test000083::test_import_compartment_units_3(), test000086::test_import_compartment_units_4(), test000085::test_import_compartment_units_4(), test000084::test_import_compartment_units_4(), test000083::test_import_compartment_units_4(), test000086::test_import_compartment_units_5(), test000084::test_import_compartment_units_5(), test000085::test_import_compartment_units_5(), test000083::test_import_compartment_units_5(), test000086::test_import_compartment_units_6(), test000085::test_import_compartment_units_6(), test000083::test_import_compartment_units_6(), test000084::test_import_compartment_units_6(), test000086::test_import_compartment_units_7(), test000083::test_import_compartment_units_7(), test000085::test_import_compartment_units_7(), test000084::test_import_compartment_units_7(), test000086::test_import_compartment_units_8(), test000084::test_import_compartment_units_8(), test000083::test_import_compartment_units_8(), test000085::test_import_compartment_units_8(), test000086::test_import_compartment_units_9(), test000083::test_import_compartment_units_9(), test000084::test_import_compartment_units_9(), test000085::test_import_compartment_units_9(), test000077::test_import_dimensionless_3(), test000077::test_import_dimensionless_4(), test000077::test_import_dimensionless_5(), test000088::test_import_eventassignment_without_expression(), test000079::test_import_fast(), test000088::test_import_initialassignment_without_expression(), test000087::test_import_reaction_flux_reference_1(), test000087::test_import_reaction_flux_reference_3(), and test000062::test_kineticlaw_without_math(). Definition at line 132 of file CCopasiMessage.h. Referenced by handler(), and setIsGUI(). The stack of messages. Each message created with one of the specific constructors is automatically added to the stack. Definition at line 125 of file CCopasiMessage.h. Definition at line 118 of file CCopasiMessage.h. Referenced by CCopasiMessage(), getNumber(), handler(), and operator=(). Definition at line 108 of file CCopasiMessage.h. Referenced by CCopasiMessage(), getText(), handler(), lineBreak(), and operator=(). Definition at line 113 of file CCopasiMessage.h. Referenced by CCopasiMessage(), getType(), handler(), and operator=().